When traveling as a family, one of the things we always consider is budget. 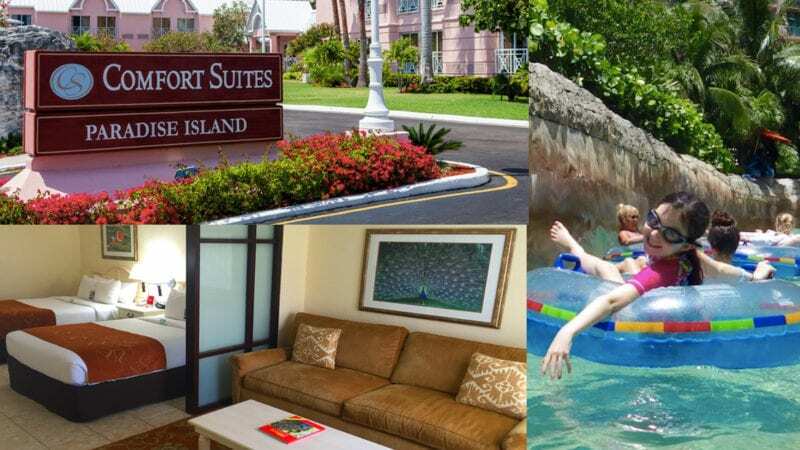 We found the Comfort Suites Paradise Island to be a great family friendly and budget friendly hotel. 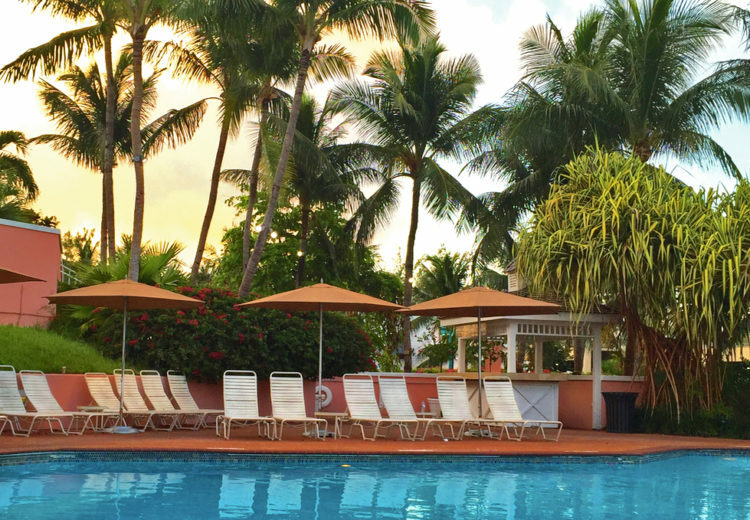 Surrounded by palm trees and tropical breezes, this hotel provides more affordable accommodations than the neighboring Atlantis resort. The best part is that Comfort Suites guests get to enjoy all of the amenities of the larger resort while having a quieter place to stay. 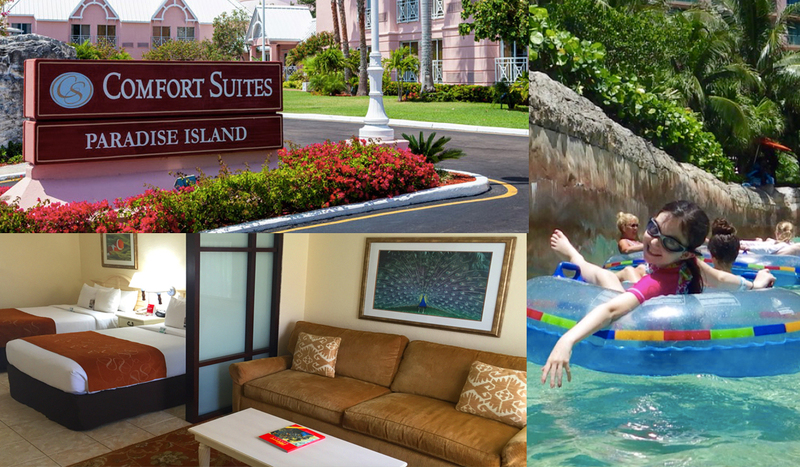 Last month, my family checked out the Comfort Suites Paradise Island in Nassau, the Bahamas. It was a welcome retreat away from the busy life we lead during the school year. I’d recommend this hotel to anyone looking for a family friendly hotel in the Bahamas. 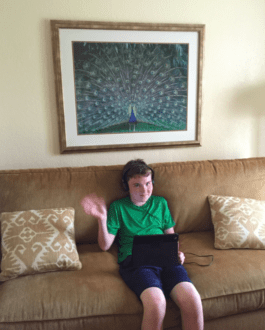 Free wifi with excellent coverage and speed – kept my Minecraft-obsessed son happy. 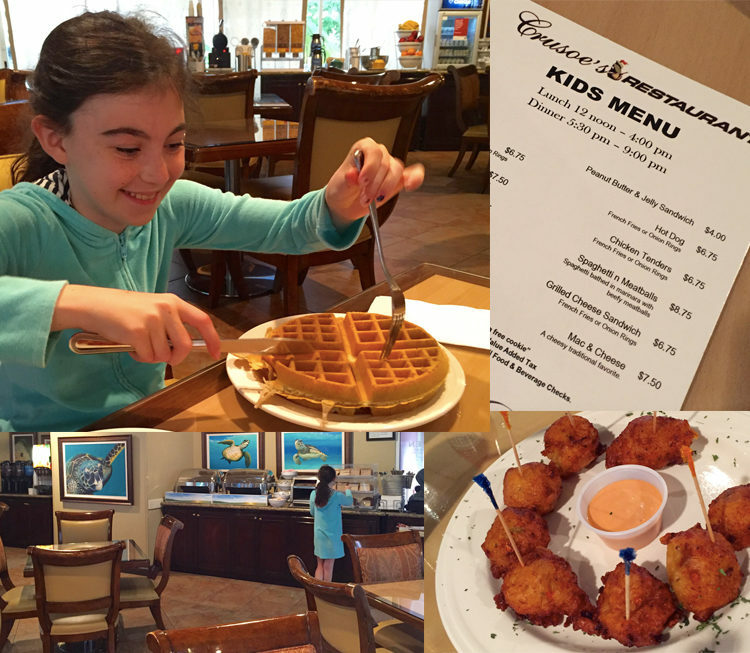 Complimentary breakfast – my daughter LOVED the blueberry waffles. We arrived in the evening and were graciously greeted at the front desk. The lobby is welcoming, with comfortable seating. The bellman was friendly and helped us find our room. There are two wings to the hotel. The front wing has two floors and the back wing has three. It’s helpful to have a staff member show you to your room for the first time, especially if you are in the back wing. Our room was a junior suite with 2 double beds and a pull out couch. Double beds rather than queens proved to be a bit small for my 6’4″ husband, but otherwise, the room was fine for a family of four. 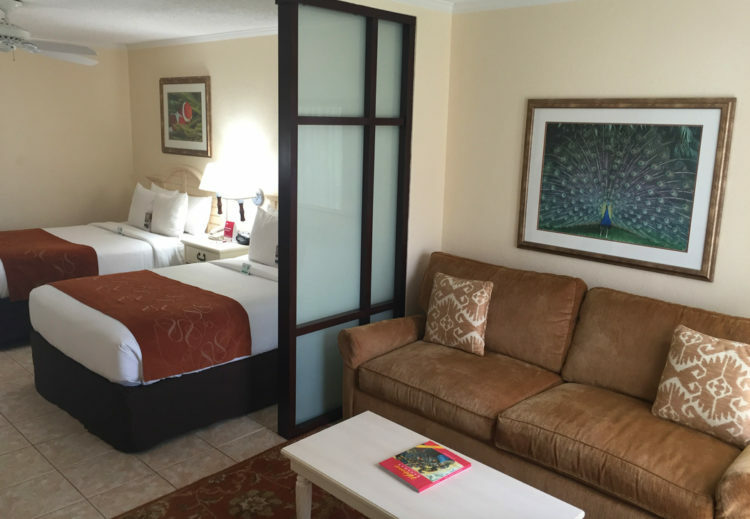 The room was clean and well appointed with tropical accents and artwork. Bathroom amenities included the typical shampoo, conditioner and soaps you find at most hotels. There was also a mini fridge, coffee maker, iron and hairdryer. The beds were very comfortable, but the pillows were a bit lumpy. The air conditioning was easy to use and kept the room comfortable in even the hottest weather. A ceiling fan helped circulate the air as well. TV programming was rather limited and the reception was not great. Having free wifi access saved the day. We were all able to use our tablets and choose our own entertainment. There was also easy access to plug in our many electric devices. When we visited in June of 2016, rates for a Junior Suite like ours was about $250 a night. 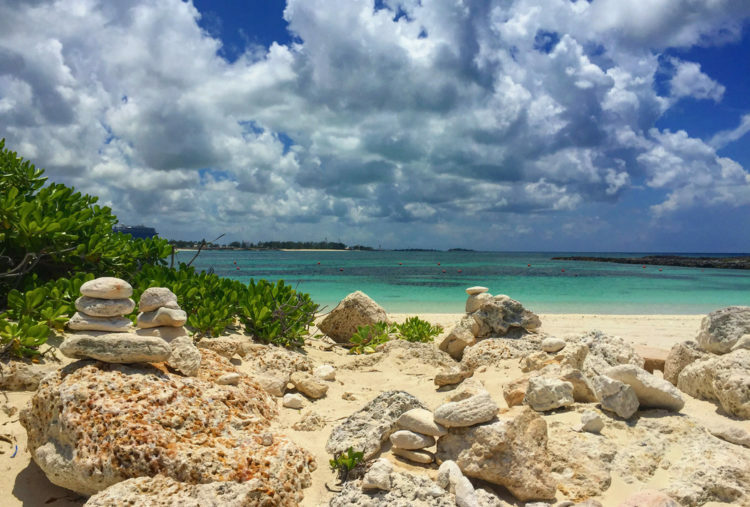 Taxes and fees are rather expensive in the Bahamas so check on these when you book. Higher season adds approximately $100 a night. The best part about at this hotel is the access to all of the amenities at the Atlantis resort next door. The resort’s premiere feature for families is Aquaventure. It’s a 141 acre water park with 9 water slides, 11 pools, countless waterfalls, and a mile long tubing river. Marine life like sea turtles, hammerhead sharks and sting rays are just a small selection of what you’ll find in the many stocked lagoons throughout the grounds. Taking a walk along the beach is a must as well! The tropical water is just spectacular! Within the Comfort Suite grounds is a lovely pool, swim up bar and a casual restaurant. There is also a tour desk and cocktail bar in the lobby area. For me, it was the perfect place to get away from the crowds of Atlantis. Since Atlantis includes a casino, it is not a smoke free environment. Comfort Suites, on the other hand, is 100% smoke free. My entire family appreciated this. Other available amenities include babysitting services, coined laundry, a business board room, and access to copy and fax machines. I was pleasantly surprised by the dining options since this is a budget hotel. The breakfasts are complimentary and include typical American fare like eggs, bacon, sausage, waffles, cereal, baked goods, and fruit. Juice, coffee and tea are also included. The waffle station was my daughter’s favorite. She made a blueberry waffle every morning. There are two locations for breakfast. I recommend the dining area near the pool. It has more seating (both indoors and outdoors) and a better view than the smaller interior dining space. For lunch and dinner, the onsite restaurant, Crusoe’s Garden Restaurant and Bar, had some delicious options. The conch fritters were a favorite. I also enjoyed the grouper. My kids were delighted to have choices like chicken fingers and hot dogs on the children’s menu. If you go off-site, there is a HUGE selection of dining options in the Marine Village and within the Atlantis resort. The Marine Village is an easy stroll across the street. My kids insisted on at least 2 visits to the ice cream and candy shops. We really enjoyed our stay at the Comfort Suites Paradise Island. I only have 2 TMOM Tips to help make your stay even better. TMOM Tip #1: There is no ground transportation provided by the hotel to or from the airport – Taxi service for 2 starts at $35. TMOM Tip #2: The Atlantis resort is HUGE. Getting around can be a bit confusing. Be sure to carry a map. What a really beautiful room and a gorgeous place to stay with the family. The beach is so pretty and the food looks delicious. I want to go to this Paradise in the Bahamas! I would love to take my family to stay here! I love the room and the scenery around it! Paradise is right! Is it wrong to admit what I really want is to dig into that waffle? I’d love to go to the Bahamas! As a whole, I love Comfort Suites and this specific hotel looks amazing! Wow, this sounds like a dream come true! I really enjoyed the post. I like the free wifi and free breakfast. It looks like a nice place that our family would enjoy. I like the free wifi and complimentary breakfasts. The resort looks pretty. I like the layout of the suites. I think this would be a good vacation spot for my family. I have never traveled to the Bahamas. It is on my list to go within the next two years. All the amenities but quieter and cheaper? I’m sold. That looks great. *sigh* Dream vacation! Everything looks so relaxed and comfortable. And the water! I love any hotel with free breakfast since I’ve had kids. I would love to take my family to the Bahamas. This hotel sounds wonderful with all of the amenities and access to Atlantis. Absolutely breathtaking! I would love to visit someday! Sounds like the trip of a lifetime ! Everything looks and sounds fantastic. I am from the west coast so the tropical destinations like this are so tempting. Beautiful photos! I love all the palm trees and vegetation around the hotel. How great that it was so close to Atlantis and the beach, too. This is a beautiful Hotel! Ohh what a beautiful place, I have wanted to visit the Bahamas since I was 15, and I missed out on a trip. Thanks for the Post, and the Pictures and the Review was very helpful! The Bahamas is a beautiful place and this looks like a great place to stay.